Neill Blomkamp’s back with a third film after his rather disappointing Elysium, but this time co-writing again with his wife and District 9 colleague Terri Tatchell, and the film turns out surprisingly entertaining and thought-provoking. It is certainly way better than the trailers and early reviews suggest. Initially, I thought it was going to be a ripoff of Short Circuit (1986 and 1988), but it seems to have incorporated ideas and elements of many other films as well, namely RoboCop (1987 or 2014), Pinocchio (1940), God of Gamblers (1989) and other titles would be major spoilers if I mentioned here. Set in the present time of an alternate Johannesburg, robots called Scouts are being used to help the police force fight crime. With an ambition to make artificial intelligence feel and learn like humans, Scouts creator Deon Wilson (Dev Patel) secretly borrows the company’s “guard key” (in the form of a USB flash drive) to activate and install his new breakthrough into a battery-damaged Scout, but while doing so, he gets kidnapped by a small group of violent gangsters and they intend to teach the Scout, that they named Chappie, to assist them in their criminal activities. Coming from Blomkamp who started his career as a 3D animator, the visual effects in his films are always amazing, with his signature style and colour tone. The movement of the robots are convincingly real as well. The music is catchy as hell. The acting performances here are not award-winning material but Sharlto Copley, who acted in all of Blomkamp’s films, fits the titular role perfectly. Despite being just a robot with only two large pixels as eyes, Chappie is an incredibly engaging, innocently adorable and cool, more than Number 5 (or Johnny 5) in Short Circuit can ever be. 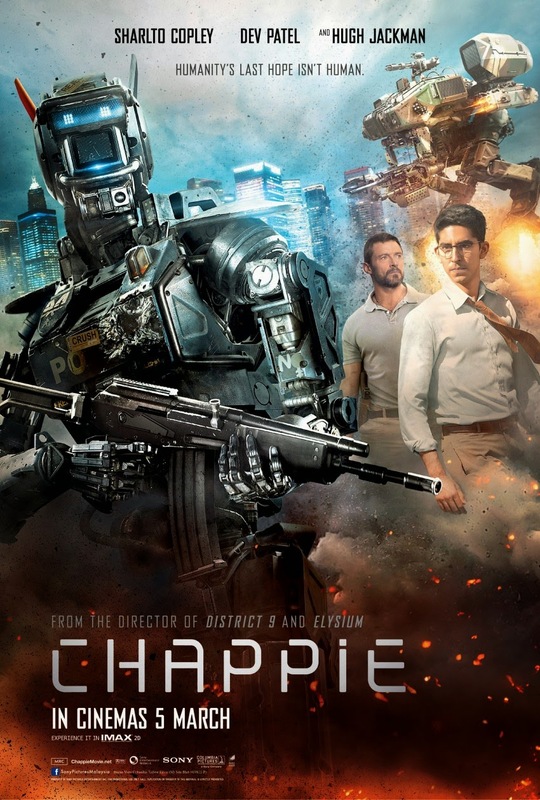 Unlike the films mentioned, Chappie is a violent, brutal and extremely vulgar for its genre. It’s like a mix of sci-fi action, family coming-of-age and crime films that mostly works. It has a right balance of action, humour and emotional moments despite its rushed narratives, cheesy dialogues and poorly developed cliched characters, like Hugh Jackman’s role as Vincent Moore, who’s nothing more than a jealous villain who wishes to ruin the protagonist’s success just so that he himself can succeed, or South African rap group’s Watkin Tudor Jones who plays Ninja (same as his rapper name), the most heartless one in the small group of gangsters whose personality sudden changes in the third act for no reason. 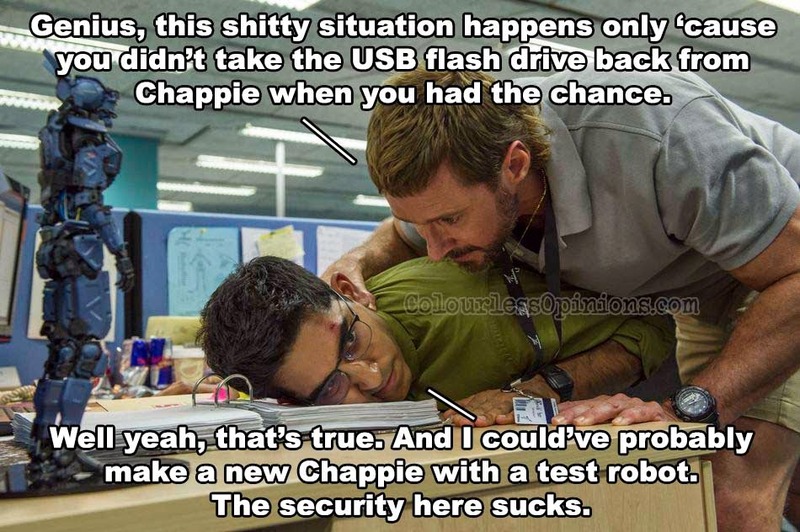 It is also unclear why Chappie is so important to Deon, its “maker”, when he is certain from the beginning that Chappie cannot be repaired due its damaged battery. It is indeed not a flawless film, but it is an entertaining movie about humanity shed in a very different light. It conveys that we are capable of being compassionate to others regardless of species or race, and not everything is born evil, but can be influenced by the people and environment. The film’s ending may also be an attempt to provoke thoughts about human evolution. Although that’s not exactly a new idea, it’s disturbing and cool at the same time. Malaysia censorship: Foul languages were not censored at all when I watched it at a public premiere. Only noticed one or two minor jumps which I assume were violently graphic sequences. Second opinion: My girlfriend liked it just as much and she’s surprised it’s currently “rotten” on Rotten Tomatoes. Verdict: Not as great as District 9, but way better than Elysium. It may not be very original but it’s brutally entertaining, somewhat thought-provoking, and at certain parts, strangely emotional.